Arts Council England, blimey! Artist Network, Darlington Borough Council, Darlington Community Carnival, Darlington Hippodrome, Darlington Dance Festival Association, Darlington for Culture, Darlington Partnership, Equal Arts, Festival of Thrift, Flying Cloud Theatre Company, Heritage Lottery Fund, Hilarity Bites Comedy Club, Luxi, Battersea Arts Centre and Jabberwocky Markets, Middlesbrough Art Weekender, Navigator North, OddManOut, Teesside University, The Hullabaloo, The Bridge Centre for Visual Arts, The Forum Music Centre and Humantics CIC, Queen Elizabeth Sixth Form. Click on the above links to find out more about each individual organisation and how Creative Darlington have worked with them. blimey! 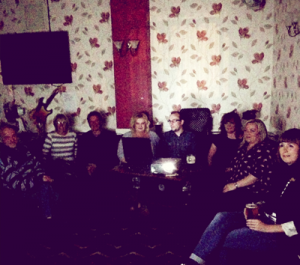 is a Darlington based visual arts collective set up in April 2007. 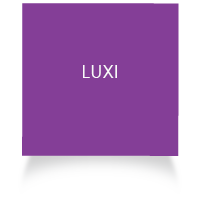 They plan and deliver arts events for the benefit of the creative community as well as a public audience. 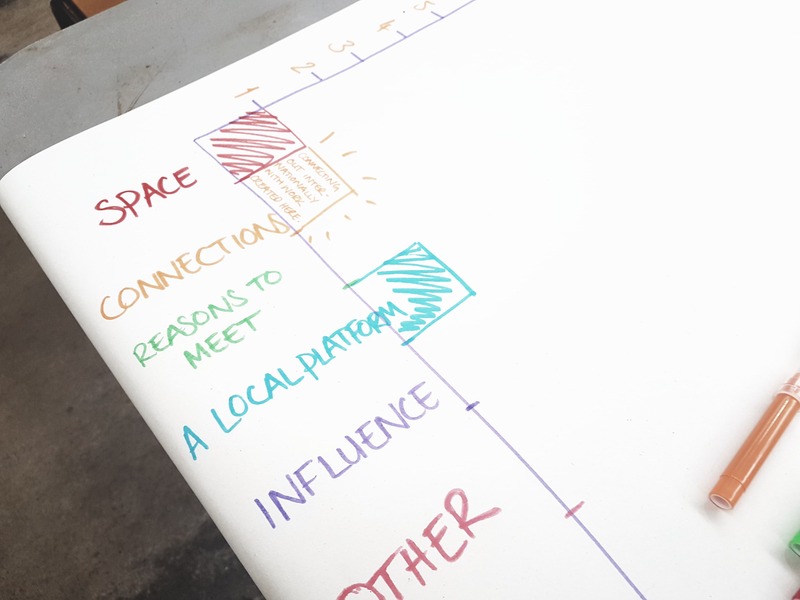 The collective aims to provide a destination for work in terms of audience as well as being a hub for sharing ideas, information and creative feedback. They intend to bring together and to raise the profile of both Darlington based artists and their work and to promote current local practice. The group held monthly get-togethers where artists met, shared experiences and knowledge, discussed work and creative practice and enjoyed critical debate. 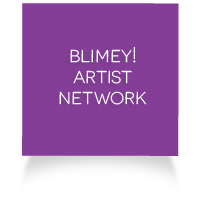 Creative Darlington has supported blimey! in programming regular talks by guest artists as part of their work (including Nick Kennedy, Theresa Easton, Nicky Peacock and Tony Charles). blimey! members have also actively supported projects, like the Art Lending Library, either led by or involving Creative Darlington. Darlington Borough Council (www.darlington.gov.uk) have played a leading role exploring new ways of working to sustain and develop the arts in Darlington in recent years . Darlington Borough Council allocate a strategic arts budget to Creative Darlington. 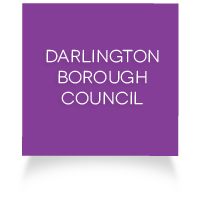 The Creative Darlington Manager post is employed by Darlington Borough Council, and a number of their councillors and senior officers attend Creative Darlington board meetings. Darlington Borough Council operates a variety of services and facilities which support delivery of the Creative Darlington vision. 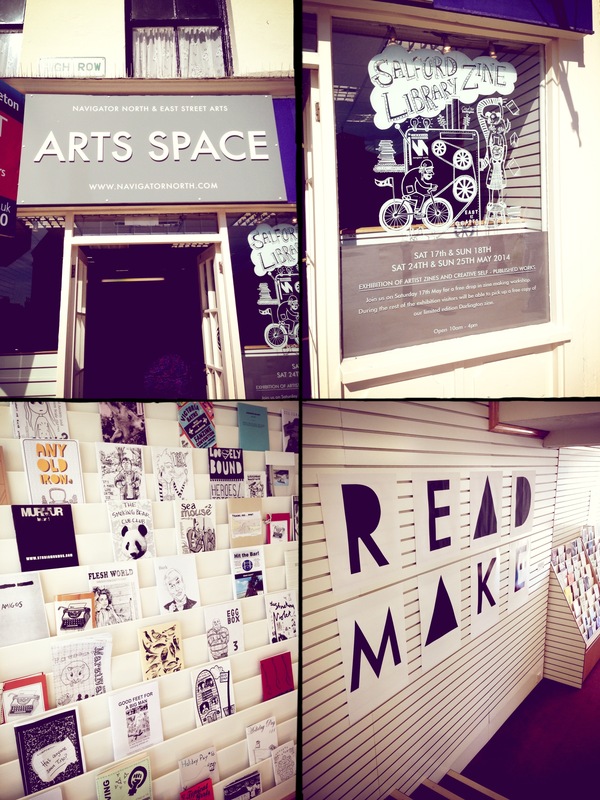 These include The Bridge Centre for Visual Arts, The Community Arts Project , Crown Street Library (within which Crown Street Art Gallery is based), Darlington Civic and The Openart Studio programme. Darlington Community Carnival was held for the 32nd time in 2014, and brings Darlington together creatively. The Carnival combines participatory arts activity, a parade, stalls, music, performances and raises funds for good causes. The Carnival is run by volunteers. Creative Darlington supported Darlington Community Carnival in 2014 in developing finance for the event. Darlington Hippodrome, formerly Darlington Civic Theatre, first opened its doors on Monday 2 September 1907 as the New Hippodrome & Palace of Varieties under the leadership of Signor Rino Pepi, an internationally renowned ‘protean’ or quick change artist. He soon established the theatre as a premiere music hall, attracting internationally acclaimed artists such as the famous Russian ballerina Anna Pavlova. Over the years many more famous names have appeared at the theatre, including Tommy Cooper, Dame Margot Fonteyn, Rex Harrison, Dame Vera Lynn, Mickey Rooney, Darcey Bussell and Sarah Millican. It’s reputation has grown over the years. It still attracts the biggest names in the theatre world and is a sought after venue for national touring. It remains rooted in the local community and supports amateur arts groups to present their work and to achieve the highest possible production values. 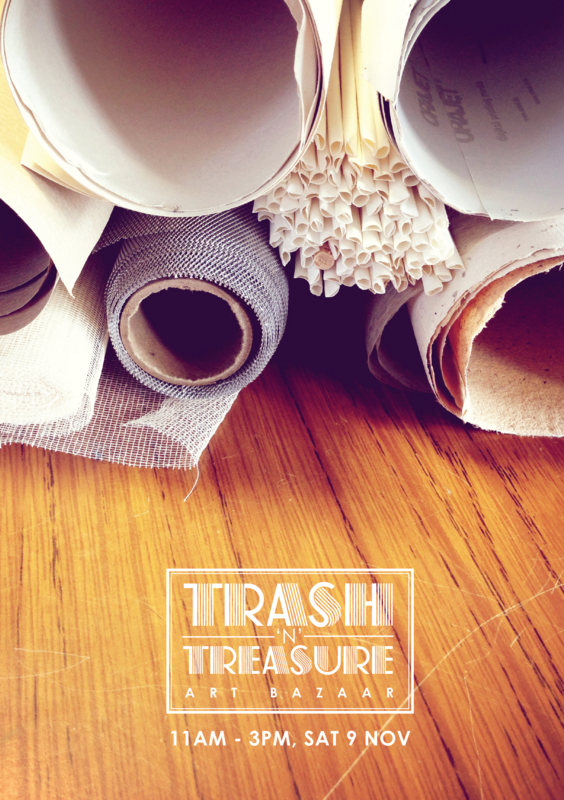 It is a much-loved venue and the source of profound civic pride. Darlington Hippodrome’s Director is on the Creative Darlington board and Creative Darlington has offered support to commission services to support audience development and to inform their business planning. Darlington loves to dance and stages an annual Dance Festival organised by Darlington Dance Festival Association (DDFA). The Festival encourages people to get their dancing shoes on through workshops and mass dance activity, and includes a dance showcase event at Darlington Civic Theatre. Creative Darlington has supported Darlington Dance Festival 2014, and the Darlington Dance Festival Association in securing support through fundraising. Darlington for Culture was set up late in 2010 to help protect and promote arts and culture in the town and became established as a co-operative in Spring 2011. Darlington for Culture’s mission is to create the conditions where arts, craft and culture can flourish for the benefit of everyone in Darlington, the wider region and beyond. Darlington for Culture’s membership includes representatives of various arts and community groups. Darlington for Culture represent their members on the Creative Darlington board. Their local knowledge, networking and volunteer capacity have supported and/or promoted various activities across Darlington. Darlington for Culture manage an annual Darlington Arts Festival which Creative Darlington helps to promote. In 2013 we both worked with Darlington Borough Council to progress public consultation around how any capital receipt from sale of the Arts Centre site will best support the arts and community of Darlington going forward. 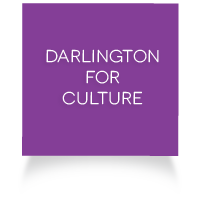 Darlington for Culture has developed their website and in extending and promoting their membership offer. •to ensure action is being taken to address them. The Partnership has no resources of its own and relies on the people and the organisations involved with it to take the actions needed to achieve its goals. The Partnership has a long term vision called ‘One Darlington Perfectly Placed’. The Partnership strives to involve as many people as possible from the community and the private, public and voluntary sectors who share the ambition of the best possible future for Darlington. Equal Arts are a registered charity with 25 years’ experience delivering arts and older people’s projects, including HenPower, which encourages older people to get involved in hen keeping as a way of reducing isolation and increasing health and well-being. Their mission is to improve the quality of people’s lives by helping older people participate in high quality arts activity. Equal Arts have worked on various projects in Darlington in the past and Creative Darlington has offered them our support to develop a creative ageing programme here. The first Festival took place in 2013 at Lingfield Point in Darlington, making a big impact regionally and nationally, with 27,000 visitors, 17,000 more than expected. 2014 saw the Festival grow with 40,000 visitors pouring through the gates increasing to 45,000 coming along to the 2015 event. 2015 was the last Festival at Lingfield Point, where they celebrated the 190th anniversary of the first passenger steam train (between Stockton and Darlington). Festival of Thrift have won a multitude of awards since starting out, including Best Event Teesside (in 2015 and 2017), Gold as North East Tourism Event of the Year and the Observer Ethical Awards for Arts and Culture, recognising the fact that artists are embedded in the programme as agents for social change. 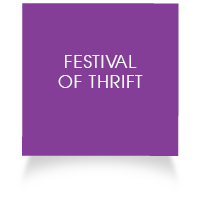 Creative Darlington and Darlington Borough Council supported Festival of Thrift festivals and organisational development between 2013 – 2015 . In 2016, the Festival moved location to Kirkleatham in Redcar. Over 35,000 people visited on Saturday 17 and Sunday 18 September to be entertained, inspired and educated about how to live thriftily and sustainably in style. Established in 2010 by Leandra Ashton, Flying Cloud is a successful collective of international artists produced by Turtle Key Arts who aim to challenge limiting beliefs, unleash creative potential and connect the world in previously unimaginable ways. Creative Darlington supported free workshops by Flying Cloud Theatre Company in Darlington which ran alongside their new play ‘The Book’. The Book Workshops (June-July 2014) from Turtle Key Arts on Vimeo. Hilarity Bites Comedy Club started in Darlington in 2007 and brings the best of the UK and International comedy scene, including the likes of Sarah Millican, Reginald D. Hunter, Russell Kane and John Bishop, to venues throughout County Durham, Tyneside, Teesside and North Yorkshire. Since 2012 they have organised an annual comedy festival, including a charity gala show, which raised money for Butterwick Hospice, Darlington Association on Disability, St Teresa’s Hospice and Daisy Chain in 2014. Hilarity Bites produced over 13 hours’ worth of free comedy in Darlington Comedy Festival 2014 with support from Creative Darlington and we also helped in financing their festival marketing. Through Jabberwocky Markets (their award-winning pop-up theatre events and festival) they partner with Battersea Arts Centre and producers across England to present inspiring, world-class theatre performances in sometimes surprising places. 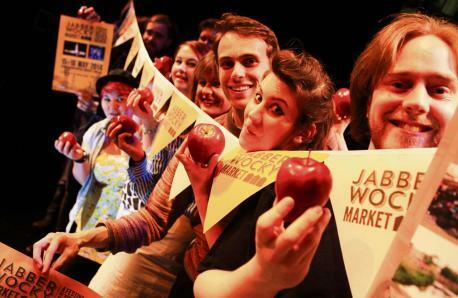 Jabberwocky Markets are part of the Collaborative Touring Network, supported by Arts Council England, Esmée Fairbairn Foundation, Garfield Weston Foundation and an Unlimited Ally. 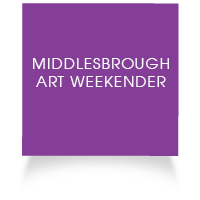 The Middlesbrough Art Weekender showcases a wide selection of international and local artists across multiple venues. 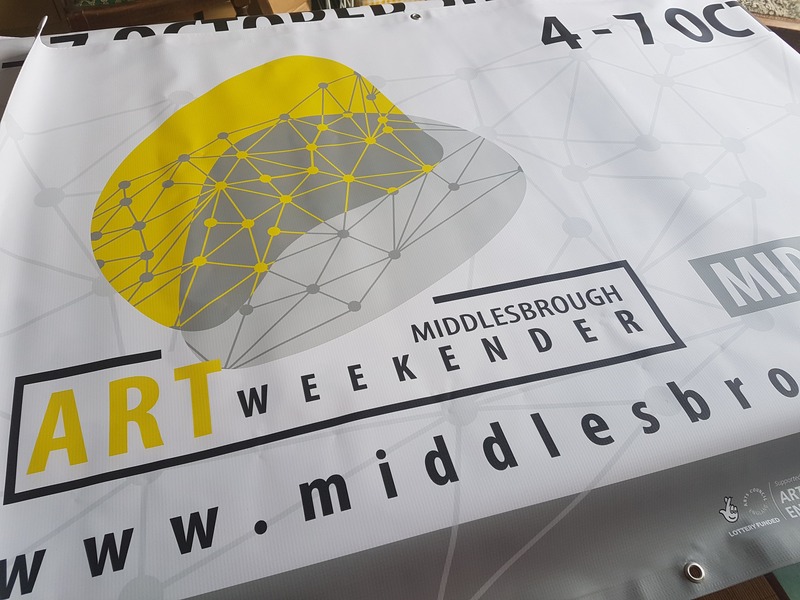 With a strong DIY ethos, Middlesbrough Art Weekender works in collaboration with local artists, galleries and institutions as well as creating new cultural space in slack and empty spaces across Middlesbrough and beyond. 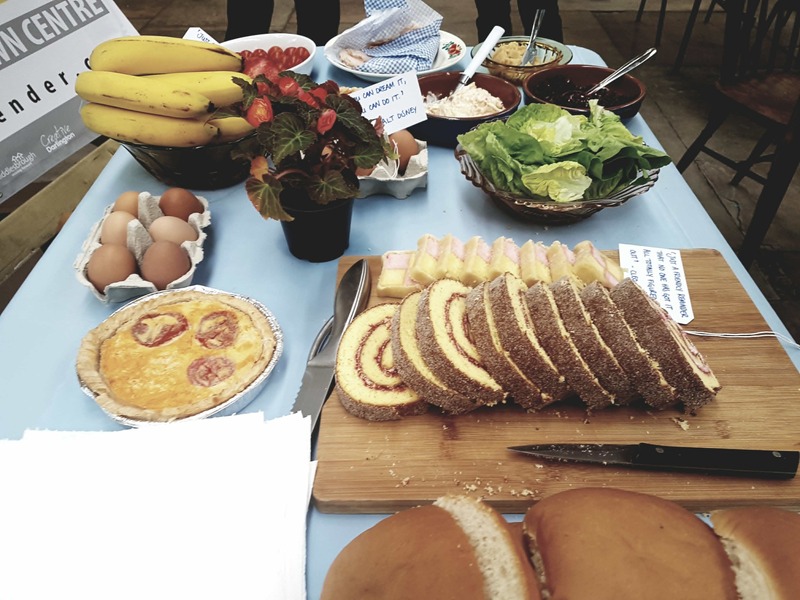 Creative Darlington worked in collaboration with Middlesbrough Art Weekender in 2018 to commission artist Lydia Catterall to host an artist picnic in the town’s market, encouraging conversation, questioning and sharing as part of extended Art Weekender activity. OddManOut formed in 2007 to perform at the Edinburgh Fringe festival and has continued to produce work and toured productions since then. They aim to support new writing and make theatre that promises to ‘challenge and surprise’. The company has a core artistic team of Katy Weir and Scott Young (a Darlington resident) and also has a growing collective of artists and theatre makers with whom they work. Creative Darlington supported OddManOut in developing and touring their Weather to Fly production to venues including the Arc in Stockton, Live Theatre in Newcastle, Queens Hall Arts Centre in Hexham and at Washington Arts Centre. The company engaged young people and writer’s in Darlington based workshops with Creative Darlington’s support. More recently, Creative Darlington has allocated time limited support to OddManOut to help them develop their organisational structure, promote their practice, build their networks and profile and support their engagement with potential sponsors. Creative Darlington hopes this support will help in establishing OddManOut as a sustainable company located in Darlington. Creative Darlington is working with Teesside University, mima (Middlesbrough Institute of Modern Art) and the Visual Arts Network, to promote arts activity and to support the development of artists and their business practice. Teesside University is a distinctive can do University which contains a School of Arts & Media www.tees.ac.uk/schools/sam and operates a campus in Darlington. 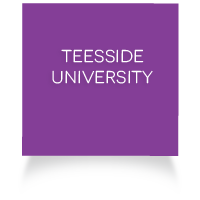 Teesside University is represented on the Creative Darlington board and works closely with Darlington Borough Council in a number of areas. 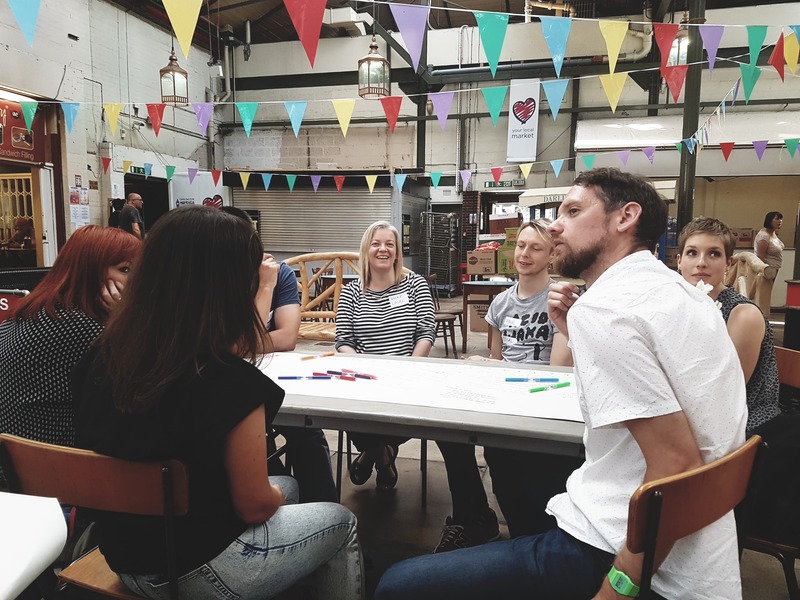 Teesside University recently secured support to develop a pilot programme of activity working with Creative Darlington to promote social enterprise in the cultural sector. Mima co-ordinate a Visual Arts Network to develop opportunities within the visual arts working across Darlington, Hartlepool, Middlesbrough, Redcar and Cleveland and Stockton’s local authorities. Creative Darlington has worked with mima and the Visual Arts Network on a number of projects in Darlington, including the Art Lending Library and Objects of Curiosity exhibitions, plus the delivery of a series of professional development seminars which secured financial support from the Network. Theatre Hullabaloo is a pioneering theatre company creating quality work for young audiences. The only National Portfolio Organisation of Arts Council England based in the borough of Darlington, they have worked extensively in the area and with Darlington Borough Council. Theatre Hullabaloo believe that creativity should be part of everybody’s childhood, and that young people have an entitlement to access theatre of the highest quality and greatest artistic challenge. 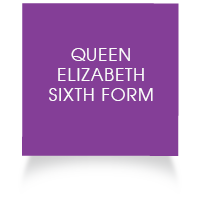 To achieve this, the organisation collaborates with artists from all over the world that are working at the forefront of their artform, developing ideas with young people, to create excellent and inventive theatre. In December 2018, Theatre Hullabaloo celebrated the one-year anniversary of their flagship theatre venue for children and young people in Darlington. Children are at the heart of The Hullabaloo – the only venue of its kind north of London, located on Borough Road – with local schools and nurseries instrumental even in the design process of the £2.7m project. 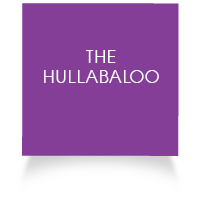 The Hullabaloo was officially opened by Darren Henley, Chief Executive of Arts Council England and Darlington Borough Council leader Bill Dixon in 2017. Since then, its pioneering Creative Play space, funded by the Gillian Dickinson Trust and free to the public, has had over 12,000 children and their grown-ups through its doors. Theatre Hullabaloo are represented on the Creative Darlington board. The Creative Darlington report committed to reinforcing specialist practice in children and young people’s arts, with emphasis on the performing arts and aimed for this specialism to be a beacon, attracting national recognition to the arts in Darlington. Creative Darlington has supported the sustainable development of Theatre Hullabaloo, as one of the borough’s key arts assets. Creative Darlington allocated financial support to develop Theatre Hullabaloo’s successful application to Arts Council England’s strategic large-scale capital programme, which secured an offer of £1.5 million, which with support from Darlington Borough Council and other funders supported the creation of The Hullabaloo, which opened in December 2017, new theatre space developing work for children and young people in Darlington. The Bridge Centre for Visual Arts, is a facility which houses visual arts services, courses, workshops and exhibitions and opened in July 2012. Creative Darlington manages the Council budget allocated to support repairs and maintenance of and supplies and services to the Bridge Centre for Visual Arts building. The Forum Music Centre is owned and managed by Humantics CIC, a Social Enterprise registered as a Community Interest Company. 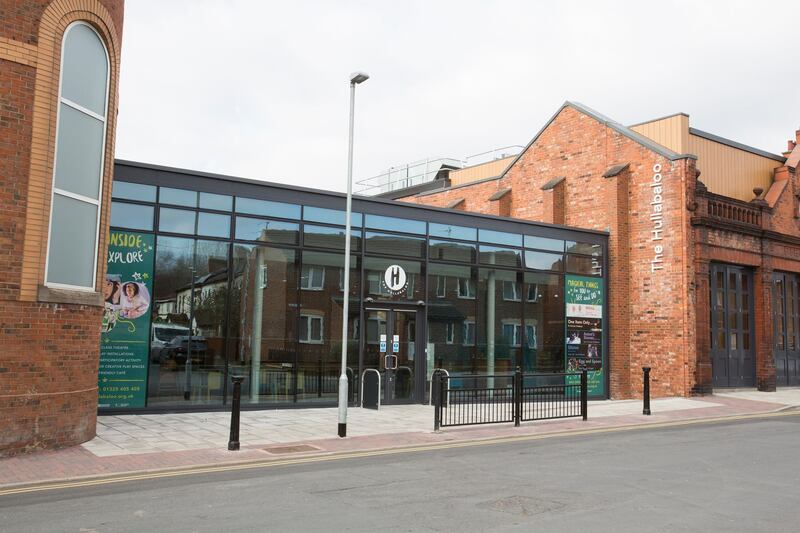 The Forum Music Centre houses a broad programme of arts and entertainment, events and training, including a number of groups and activities which relocated there following the closure of Darlington Arts Centre. The Forum Music Centre hosts Access to Music training courses, and promotes regular concerts, film and comedy nights. 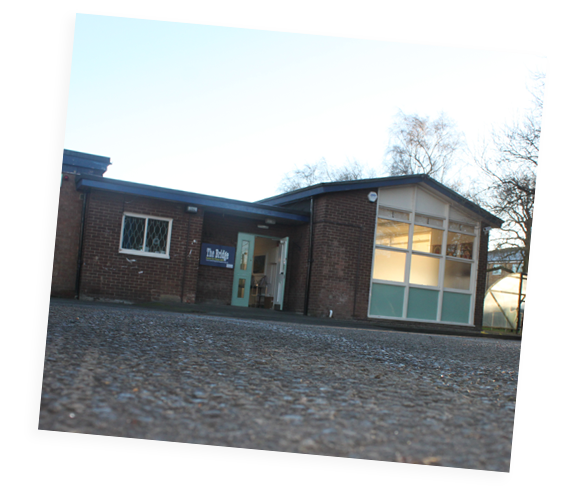 They offer rehearsal, recording, performance and social spaces, programming capacity and a range of technical support. Neither the Forum Music Centre nor Humantics CIC are subsidised by local government. Creative Darlington has supported Humantics CIC in contracting time limited organisational development work. They have recently worked with a range of organisations to inform changes to their operating systems and to advise on their business planning.